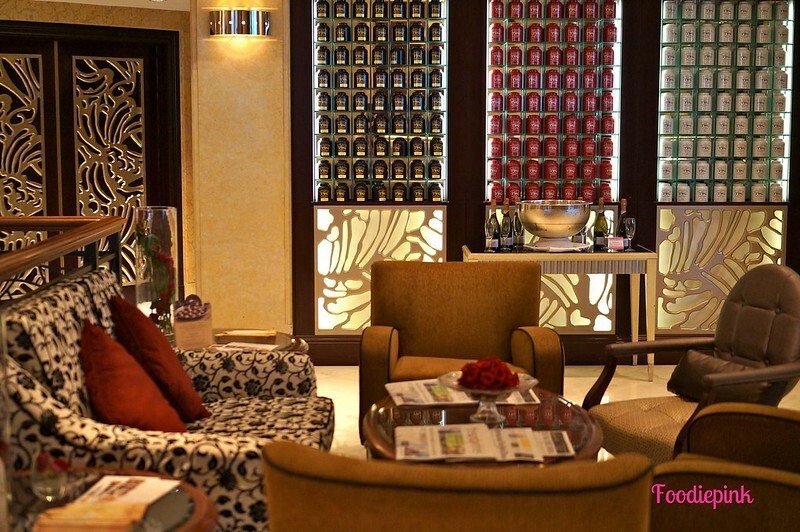 The posh waiting area of Rose Veranda is just a lead-up to what you will be in for when you dine here. The space has been revamped a number of times, but remained as popular as ever. I did not manage to get a photo of the main dining area, but just imagine a double-storey ceiling, surrounded by full-length tinted glass windows, huge plush chairs on dark royal blue carpet and tasteful chandeliers overhead. 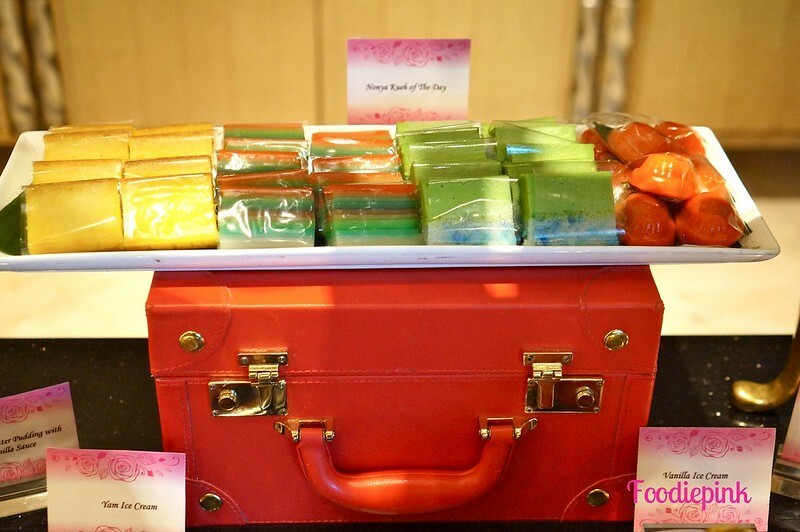 Shangri-La Hotel has certainly done it right. A full coverage ahead! 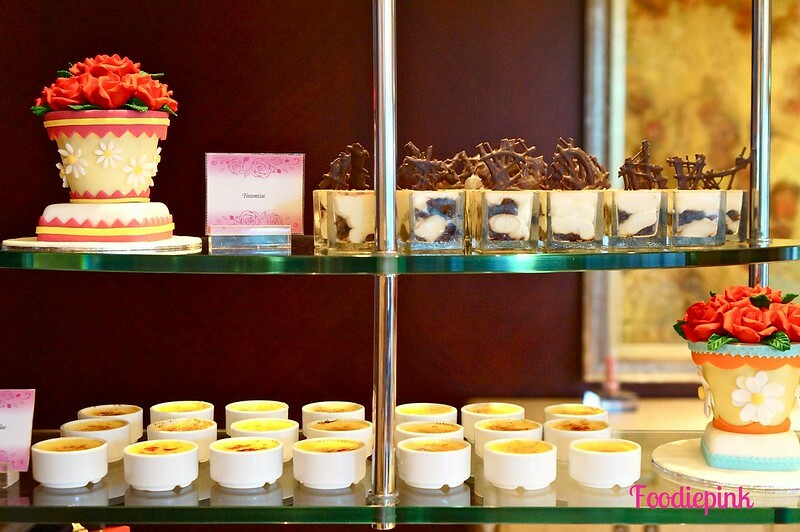 Weekend High Tea at Rose Veranda is priced at $45++ per person. 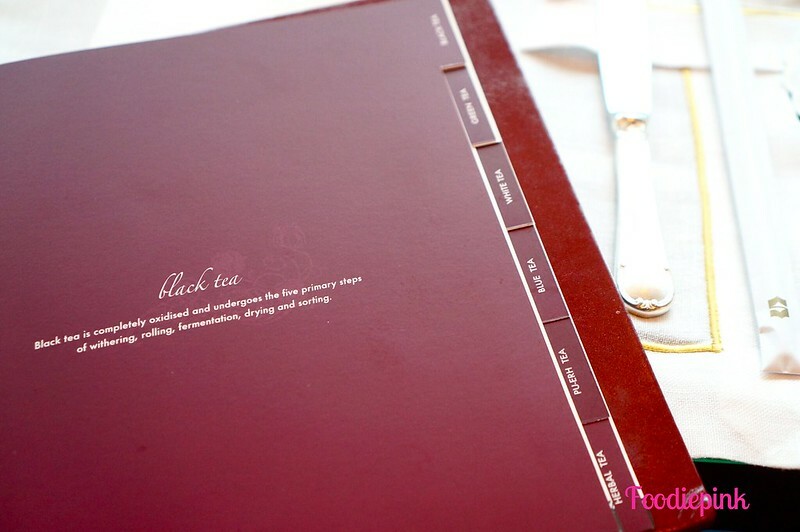 Extensive tea menu – every kind of tea can be found here! 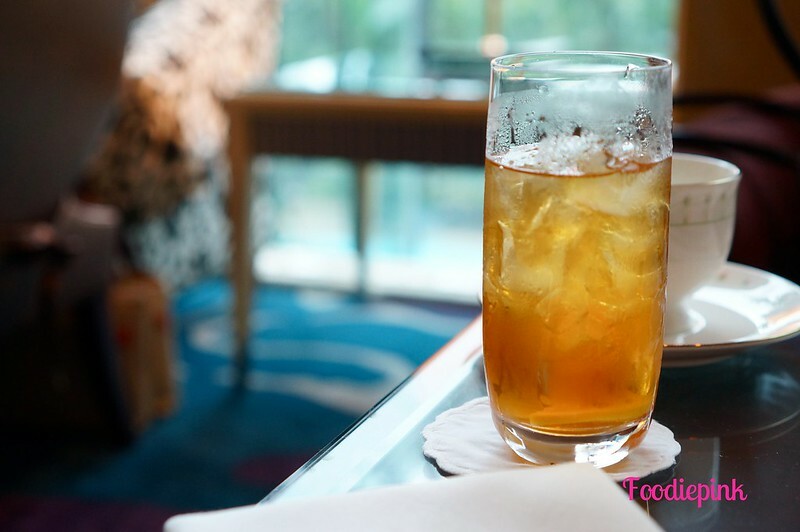 A cup of chilled welcome tea – some fluid to get you going while you (try really hard) to decide your choice of tea. 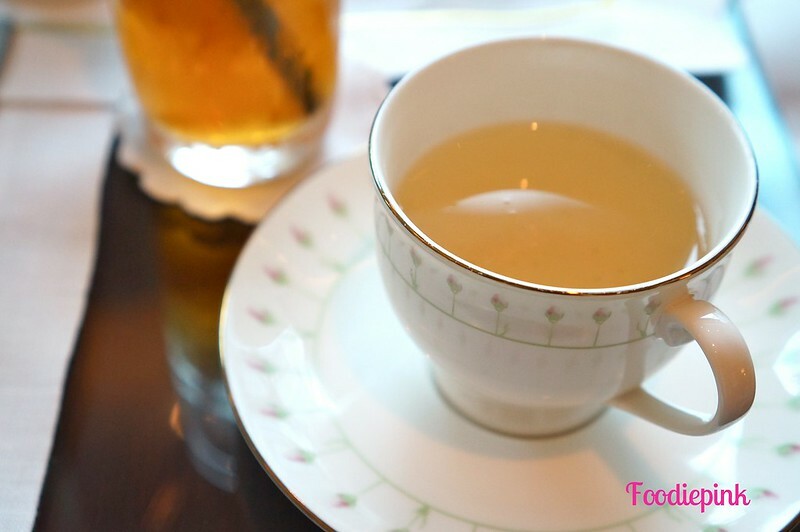 Sticking to my usual Shangri-La Rose Tea – subtle with a rosy fragrance. Nice! Tip: walk till the end of the buffet line. 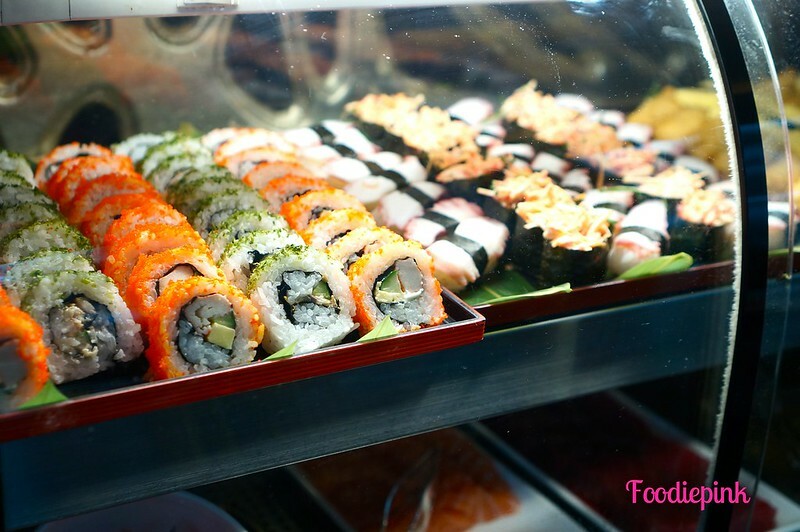 Many missed this treasure of sushi and fresh sashimi as the fridge was hidden at an angle from the main buffet line. 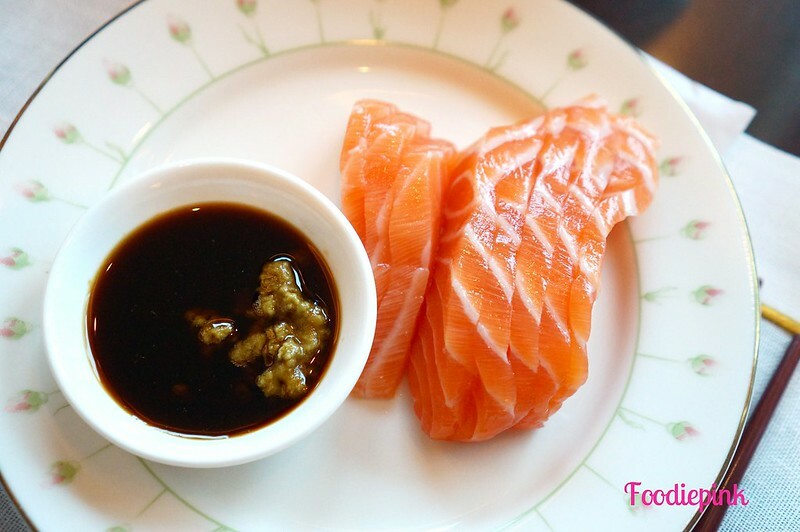 These slices of salmon were fresh and firm – you definitely can’t stop at only one helping! One of the rare occasions I take fried wings (yes, more than one in fact), ‘cos they’re too good to be missed. And, they do look healthier than what fast food chains are selling (I suppose). Salmon quiche was just as delicious! 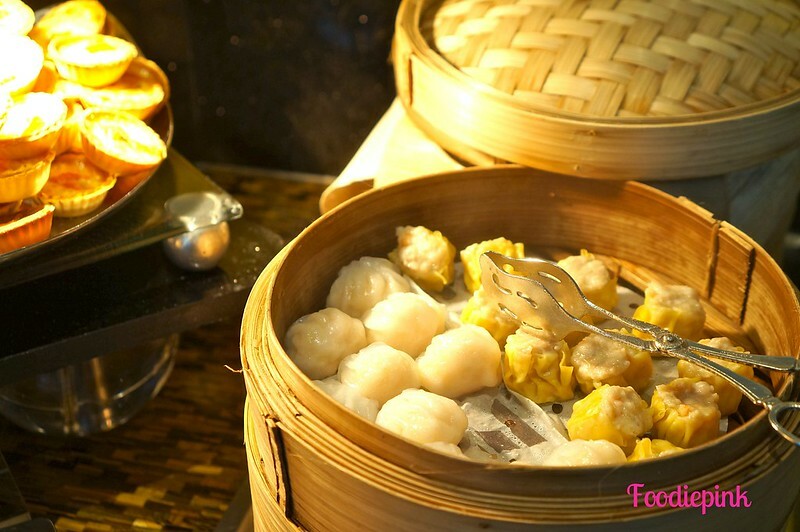 Chinese Dimsum – not your usual frozen dumplings. 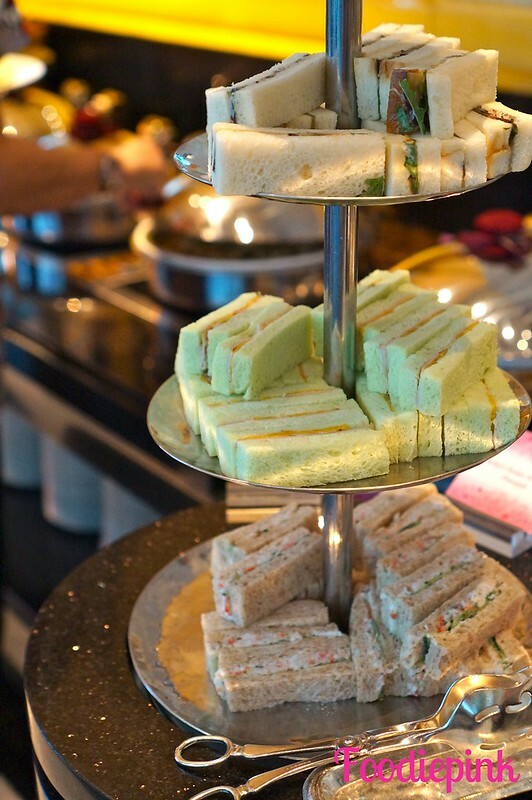 My favourite part of having high tea is having finger sandwiches! Nowhere else does it better than Rose Veranda, I promise. 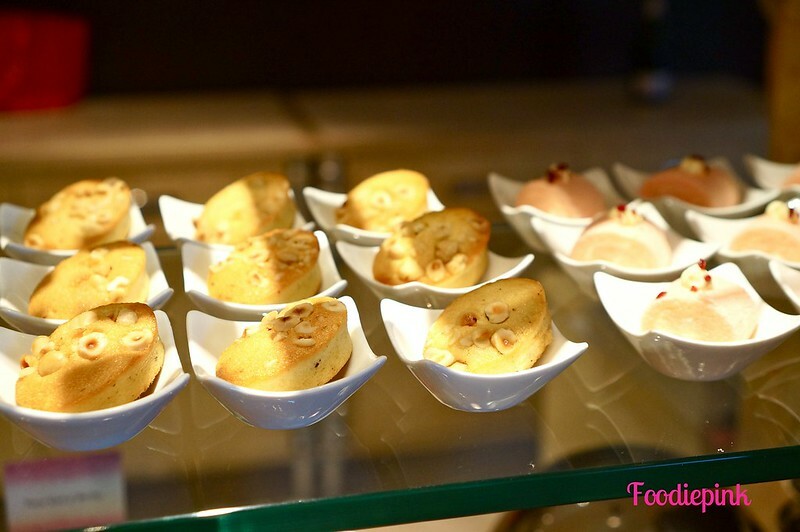 The bread was soft and fluffy and the fillings, including smoked salmon and mixed seafood mayo, were just as good. 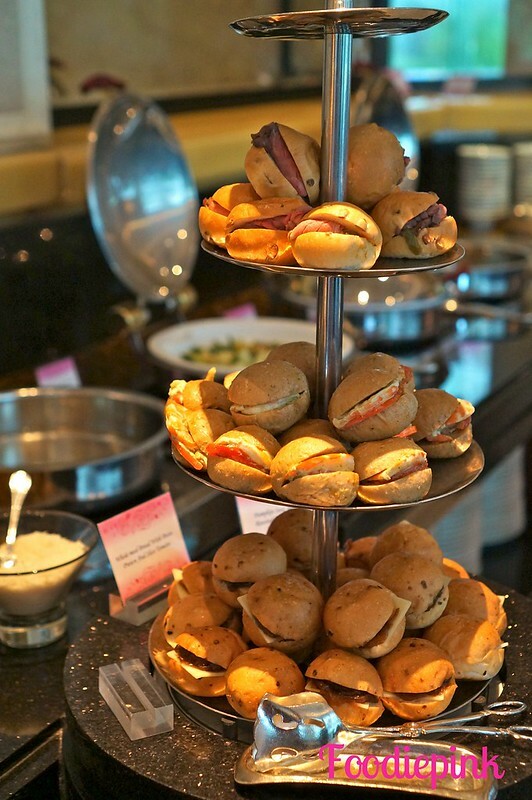 The other 3-tier stand held mini buns. Personally, I prefer the finger sandwiches. There’s an entire shelve dedicated to DIY salad and salad dishes. I particularly liked this smoked salmon roulade. I first picked it up as it looked really pretty, with seaweed (I’m guessing) weaved into the cream cheese filling. It surely did not disappoint in terms of taste too. 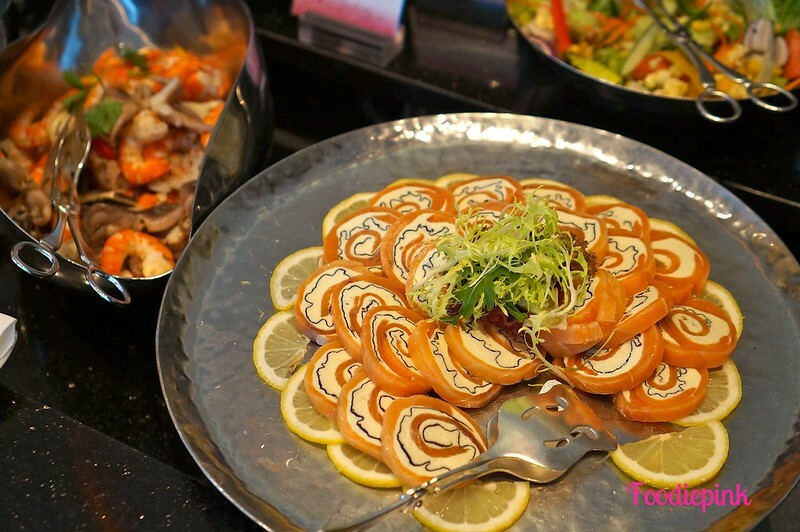 Second round consisted of salad dishes, such as prawns, pastas and tomato salad respectively. 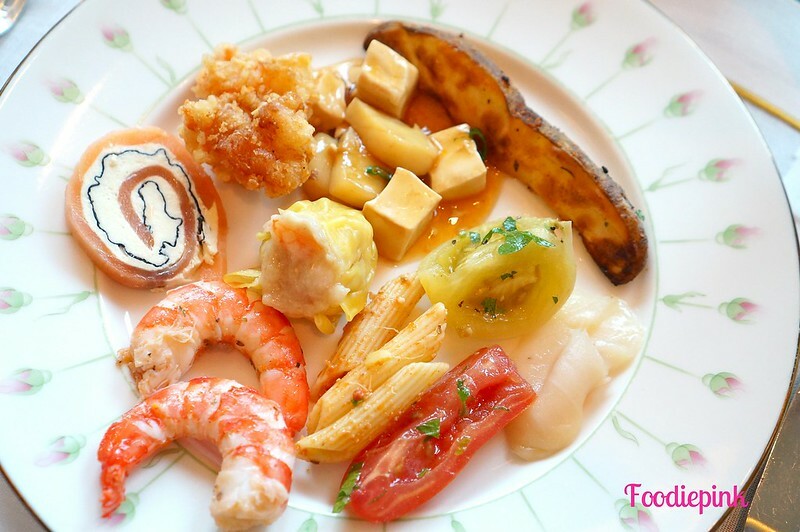 There were hot dishes like scallop tofu, potato wedges and cereal prawns – all of which were delightful in their own rights. 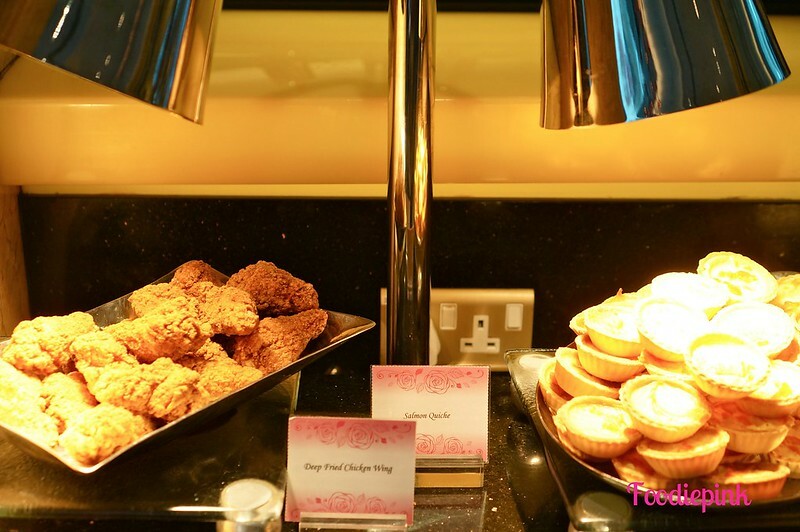 Apart from the buffet line, the service staff went around tables with trays of food for us to sample. 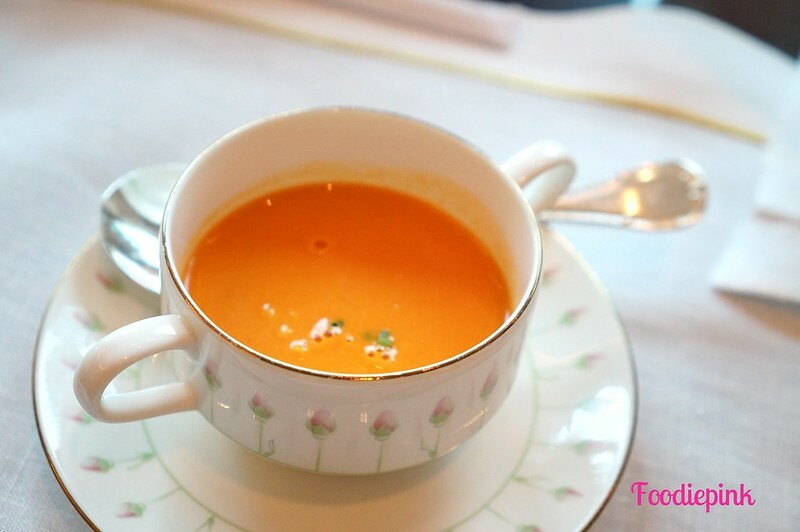 This was carrot seafood soup. 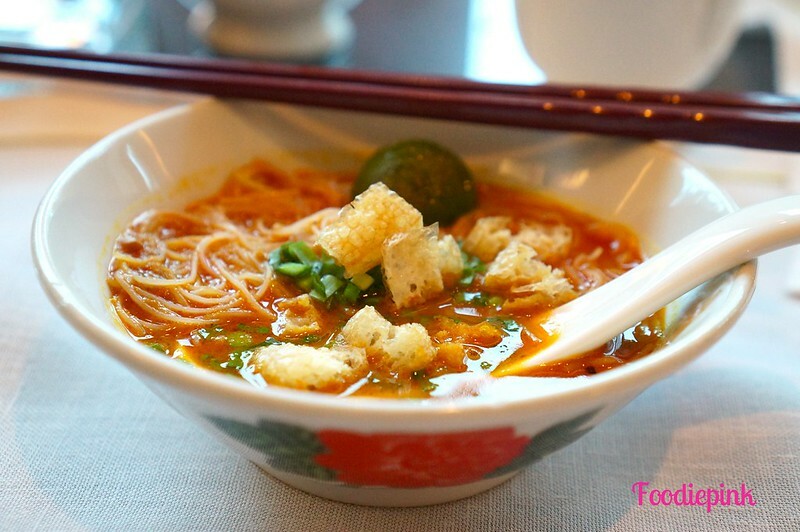 DIY Mee Siam: one word – sedap! 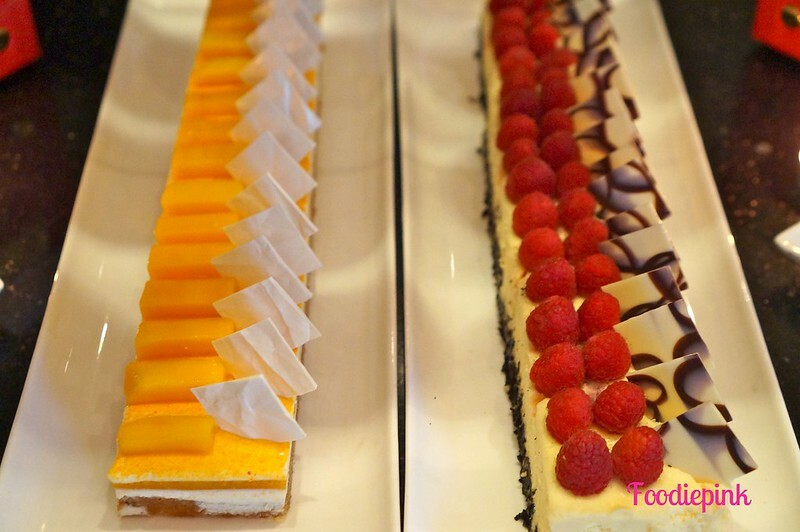 Remember to leave half your stomach for desserts, ‘cos the variety was really quite impressive. 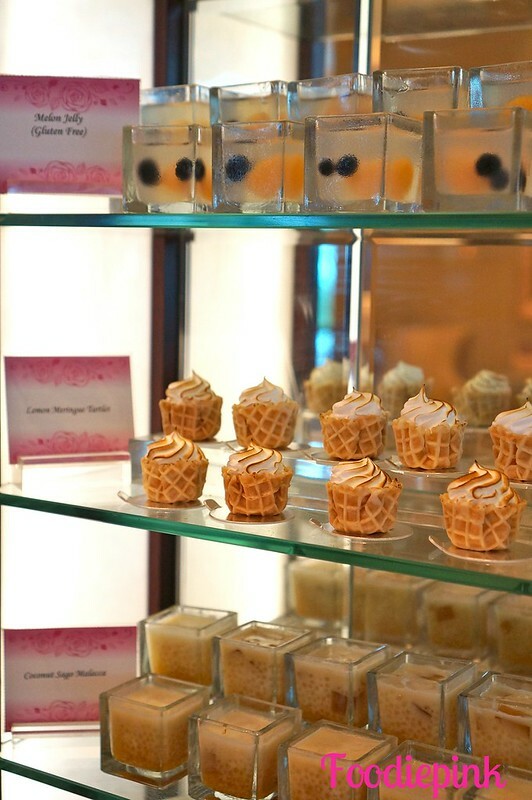 All of the desserts were portioned out – either in mini glass containers or sliced for your convenience. No doubt, I was spoilt for choice. 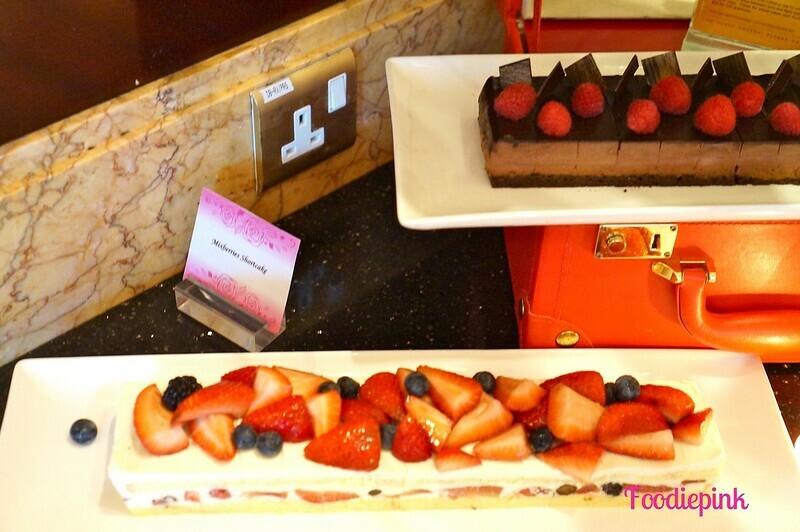 Instead of whole cakes, long rectangular ones were sliced up into mini portions and decorated individually by slice. This way, you will be able to taste more flavours and the cakes won’t be ruined by people who attempt to halve the slices (which usually happens for whole cakes). The strawberry shortcake had really generous amounts of toppings! 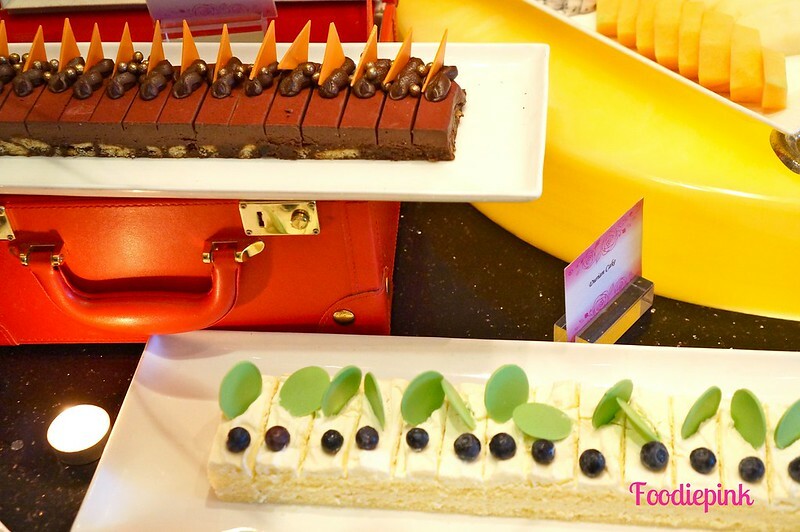 Their durian cake is a must-try! 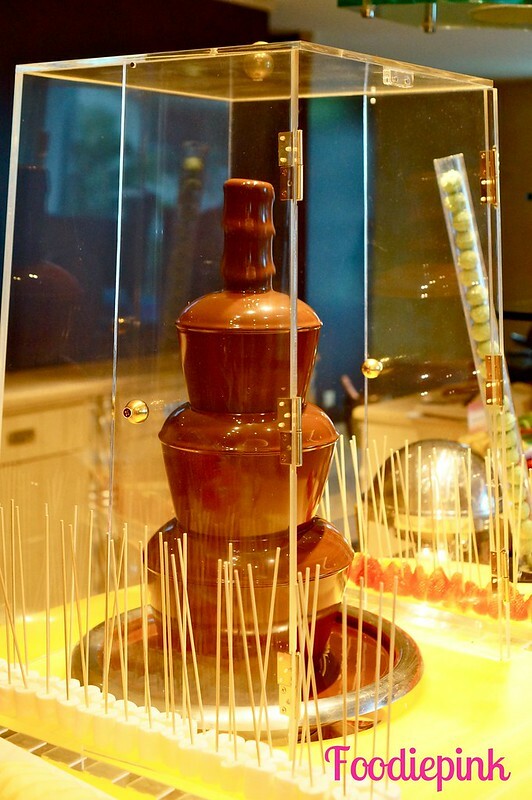 Chocolate fondue that observes the highest level of hygiene! 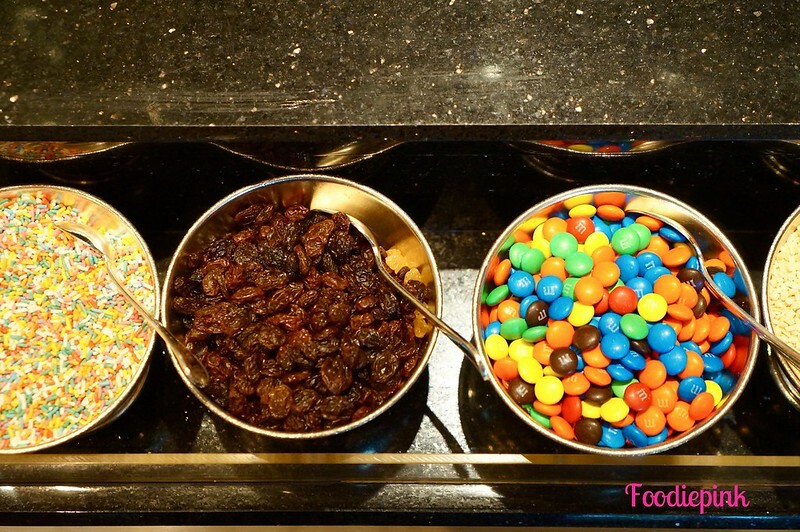 Toppings for your ice cream. 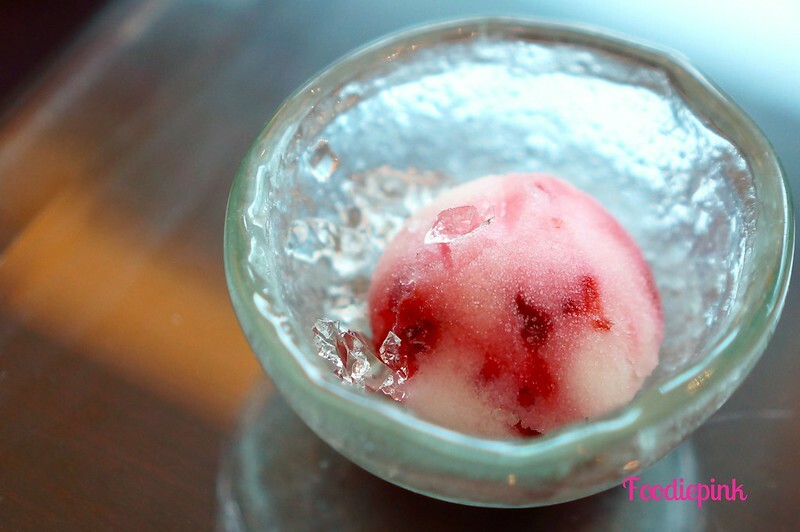 Another sampling dish brought to our table – Raspberry Yuzu Sobert with Champagne Jelly. Hands-down one of the best frozen desserts ever! 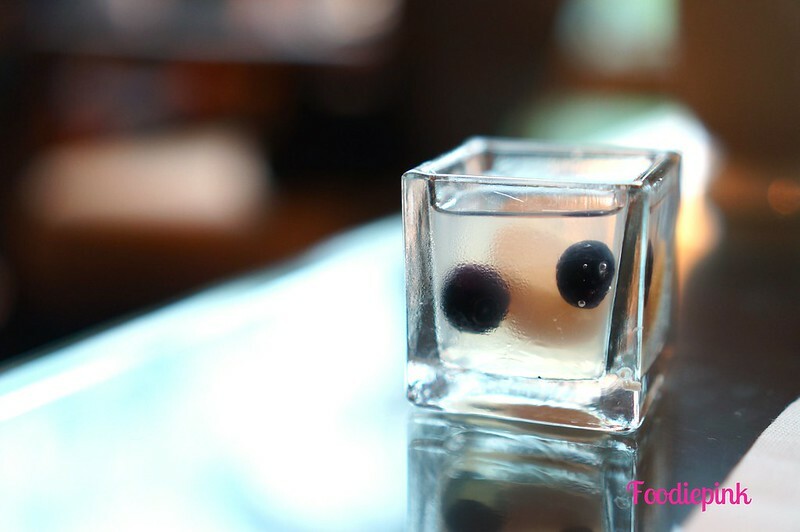 After all the food I had, all I needed was something icy and sour to wash it all down. 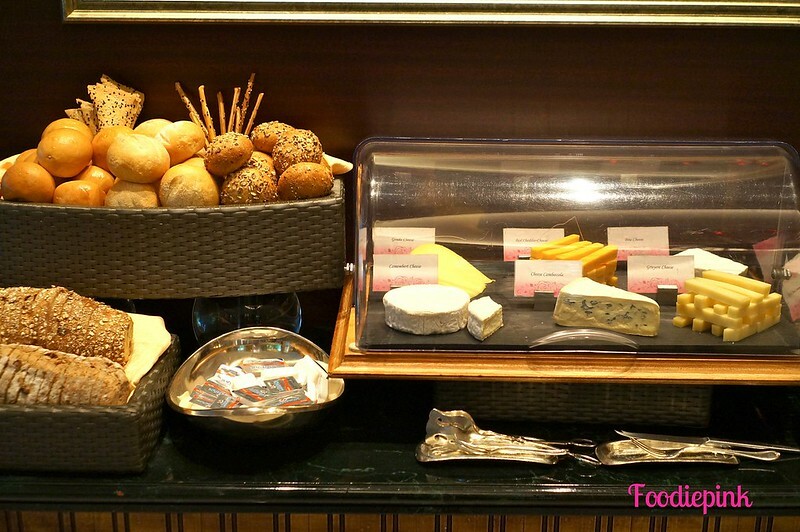 IF you have any stomach left, there’s always the bread and cheese tray. 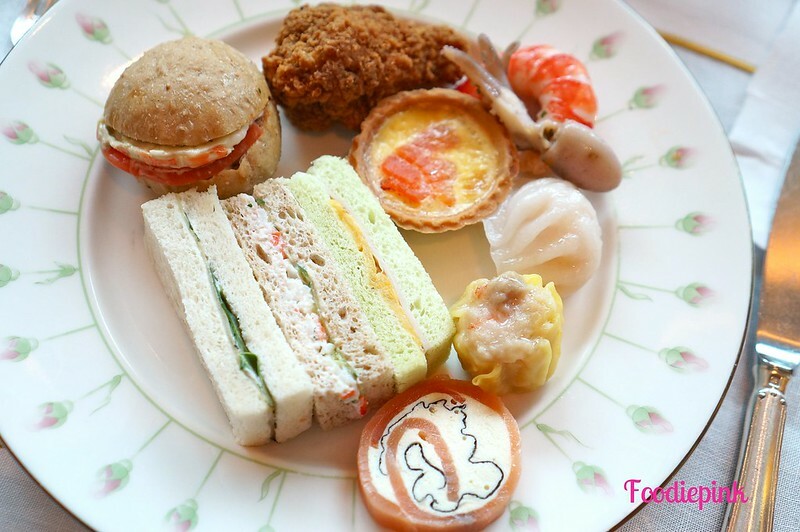 Rose Veranda is the go-to place for high-tea. 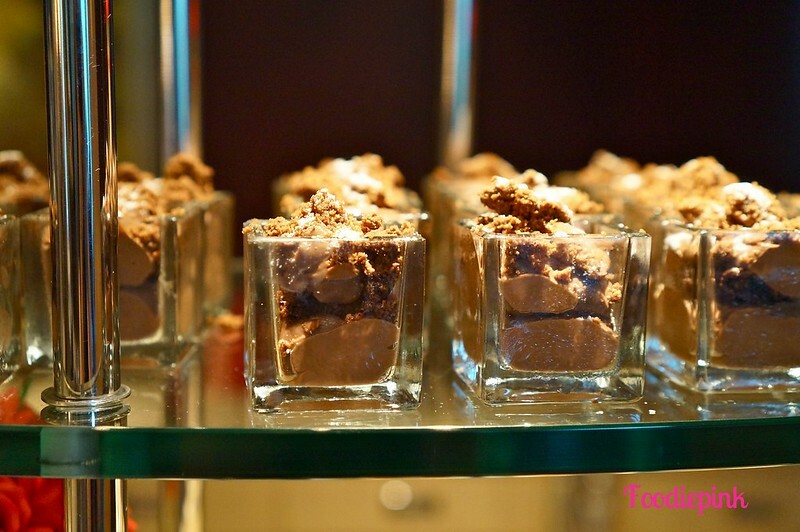 The ambience is perfect, food is indulgent and service is impeccable. Your weekend will be definitely well-spent here! I just want to say that I really love your blog. I have been browsing for many years searching for a blog that captures really beautiful, clear pictures with a cute personality and this is the one. To me, you are a professional photographer and a good blogger. You really do keep the readers in mind, for you clearly labeled all the pictures with the food that goes with it. Making sure that the dessert goes last. The blog itself is simple yet pleasing to the eyes. Please keep up the good work.